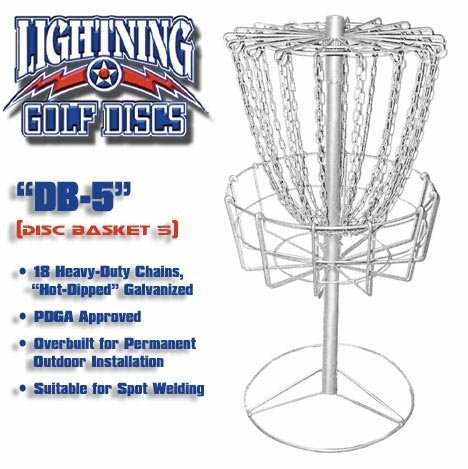 The Lightning DB-5 portable Disc Golf target is designed to be a workhorse in all weather conditions - do not be fooled by lower priced targets as you will get what you pay for. The DB-5 has all five pieces "hot-dipped" galvanized and built for long term outdoor use or permanent installation. This target will outlast any of the thinner gauged powder coated targets on the market by far. Features include 18 chains and easy 2-minute assembly. Weighs 51 lbs and is PDGA approved for tournament use. May also be converted for permanent installation. If you have any questions about this product by Lightning, contact us by completing and submitting the form below. If you are looking for a specif part number, please include it with your message.